Rosemarie must have been reading a long time (and I thank you for that Rosemarie) because it’s been a while since we talked about my favorite make-up tip. No tricks, this is really what I look like at the end (and usually the beginning) of my day. Exhausted is an understatement. Sometimes I don’t have the time, energy, inclination or motivation to get cute. 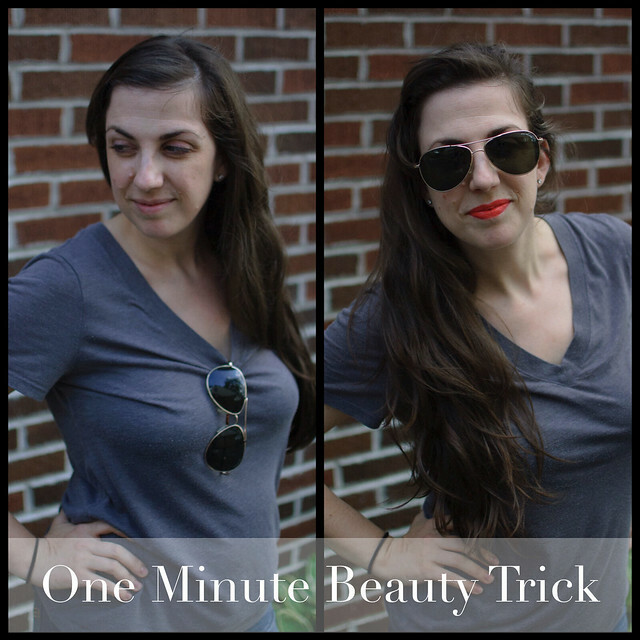 So I fake it with the one minute beauty trick. I wear bright lipstick because I’m a bright winter, but this shade won’t look good on everyone, pick a color that looks good on you, a handy pair of shades (these are from the gas station, very chic) and voila. Nobody needs to know I was up at 4 am with the baby, just worked an 11 hour day in a steel mill and haven’t showered since Saturday. I might be the only person that needs this but you could you do a post about actually putting lipstick on. I can never get it right. I see people did it on TV and they just swipe and their done. For the life of me I can’t do it. No one I know wears lipstick : ( You always rock it so well. Yes absolutely! Swipe and done doesn’t work for me either, not with the bright colors I wear! Look for it next Tuesday, thanks for the prompt! Sunglasses and bright lips may save my sanity this summer. THANK YOU!! And being photogenic doesn’t hurt.